DLFwriting: Gone in 90 Seconds? ﻿As I put the finishing touches on my material for my trip to the 2012 Writer's Digest Conference, I am preoccupied with the idea that I will finally sit down vis-à-vis with an acutal literary agent. While I've been a terrible, no-show blogger of late, I have been focused on preparing my work and researching the different agents I will have the opportunity of meeting on Saturday. I've prepared the all-important query letter, assembled a synopsis, and polished the draft. After working on this novel, this idea, for more than ten years, I will have 90 seconds--that's right, 90 seconds, to pitch the work. The distillation process has been a long one. Working my idea, my 93,000+ word manuscript into a single-paged query letter was an arduous task. Despite the ability to hit two or three pages, the synopsis did not prove to be any easier than the query. Thankfully, I've had some help and some great support. But when I find myself sitting before an agent, 48 hours or so from now, I need to be ready to present my work in a concise, coherent, fascinating fashion with a sprinkling of vivid and engaging plot points that encapsulate the crux of the story and reveal the main characters and conflicts. 90 seconds, so that the agent catching the pitch can have a moment to provide feedback on the presentation, and, presumably--hopefully, show interest. Then it's time to hustle off for the next pitch with the next agent, trying to incorporate the previous agent's suggestions on the fly. Just writing about the prospect loops my stomach in knots. I can only imagine how I'll feel before the flesh and blood people and not just the abstract idea of them. When I dwell on this abstract idea, I can't help but think of one of my top-5 favorite films of all-time, "Ghostbusters" (1984). 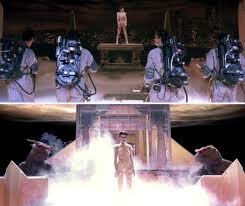 ASIDE: not that you're interested, but "Ghostbusters" slides in at #4 of my top-5 faves. "The Matrix" (1999) is #1, the original Star Wars trilogy is #2, "Braveheart" (1995) is #3, and "Casablanca" (1942) is #5. I've worked all of this time to piece the narrative together, to develop the characters, to imagine and paint the setting, and now I have to scale the mountaintop and secure someone's attention. But will I be ready to perservere beyond this final obstacle? It's this idea that I'm standing outside of the publishing world and can only be legitimately admitted by a publisher, after working with an agent and an editor, that takes me to the climactic scene of Ghostbusters. Dr.s Venkman, Stantz, and Spengler, along with Winston Zeddemore, are standing on the roof of a building, facing off with Gozer the Gozerian. Winston Zeddemore: Ray, when someone asks you if you're a god, you say "YES"! I have this irrational fear that I'm going to sit before these agents, these gatekeepers to the world of publishing, and they'll find me wanting. They'll ask, are you published? And of course, the Ray Stantz in me will reply honestly with a "No." 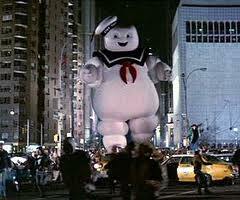 Then I'll be blown off the roof to be consumed by the Stay Puft Marshmallow Man. I realize this is silly. I'm going to this conference not with the expectation of landing an agent, but with the hope of learning enough about the industry to better polish my writing for publication. Still, I can't help but imagine a scenario that I completely wow someone at the conference and they find my work ready to take the next step in the process. And if they do blow me off the roof, I might be in some trouble. My inner-Ray Stantz won't be able to keep its mind clear, either. And God knows what form the Traveller would take for me. Since a big part of this entire process involves crafting a query letter, I've copied the one I put together below. What you'll read is a general form that will be personalized for the different agents I submit it to. I'd love some feedback. Wish me luck on Saturday. Adam Anderson has been tapped to be the conduit through which the gods and goddesses of ancient empires seek to regain a foothold in the world of modern humans. As he comes to realize these deities are as weak and broken as the people who once worshipped them with blood sacrifices, he struggles to ascertain whether he is a new kind of hero or another head on the altar. Visions of a striking woman, a shadowed warrior, and a shriveled wise-man plague the sleep of Adam Anderson. As he wakes shaken for the third time in three nights, he finds nothing in the dream but additional questions to his already quandary-filled existence. When Adam is approached by Hermes, it is the Greco-Roman messenger god who promises the answers in exchange for the rescue of the very real goddess of his dreams. While preparing Adam for the quest, Hermes finds himself accosted by deities from other Earthly realms. When tidings of murder echo in the halls of Olympus for the first time in millennia, Vishnu, Indian protector of the world’s moral balance, angles against the new Council of Deities to stabilize the scales that have been tipped by a mysterious malevolent force. But can the envoys of these distinct cultures unify in time to prevent this shrouded evil from begetting a war that would destroy them and all of mankind? Mythos is a completed 93,000 word contemporary fantasy adventure. Written in 3rd person limited point of view, the narrative weaves multiple perspectives while remaining focused on the journey of Adam Anderson. It is Adam, beginning his journey against the tropical backdrop of Miami Beach, who is assaulted within the glistening spires of Olympus, trapped beneath the ageless stones of the Great Pyramid of Giza, and stalked through the lush forest of the Ōu Mountains above Sendai, Japan. While he fights to save the goddess of his dreams, he doubts whether he is the hero the world needs or a sacrifice to the labyrinthine corridors of the Underworld. I am a life-long lover of story, in all its incarnations. I hold a bachelor’s degree in English from Florida International University, where I concentrated in Creative Writing. While there, I studied under acclaimed authors Les Standiford and John Dufrense. I have spent much of the last ten years teaching Literature, Mythology, and Creative Writing at the high school and middle school levels. I thank you for your time and for your consideration of this proposal. Yes, you will do it! Not only are you a gifted writer but now you have a wonderful wife, and two great kids who know that you are the greatest person on the planet--How could you possibly go wrong!